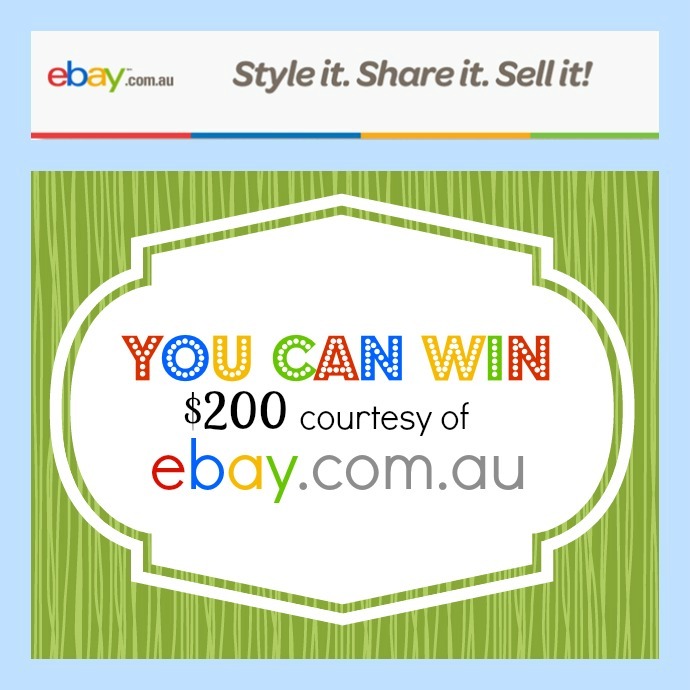 Win $200 From ebay.com.au's Style it, Share it, Sell it! | Life Love and Hiccups: Win $200 From ebay.com.au's Style it, Share it, Sell it! Win $200 From ebay.com.au's Style it, Share it, Sell it! See the bottom of this post for the winners details. Did you know that ebay.com.au have a brand new app that makes selling your stuff on ebay even easier? Either did I until recently, and now I am beyond excited as I rub my hands in glee. Thank you Style it, Share it, Sell it! - you have just made my life a whole lot easier. Now you would know from the photos I have previously shared of my festering pit of shame, that we have correction HAD a lot of stuff in our garage. The problem is as fast as I can get rid of all that stuff, my husband is finding more stuff at council clean ups and bringing it home. He even helps his mates out by taking stuff they no longer want off their hands for them and well quite frankly our garage just isn't big enough for his generosity. Now I have put my foot down and I have thrown him the challenge. Turn that junk into money or it's gone. Like MY kind of gone, personally driven to the tip and buried under everyone else's unwanted stuff, kind of GONE! The first bit of Stuff I had in my sights was this eyesore of a lawn mower. I DON'T CARE that it is a Professional Greenkeepers mower that has only been used 6 times. We don't have a bowling green or golfing green in our box of a backyard, so to me it's just a freakin large green lawn mower that is taking up way too much room and I wanted it gone! Bless him, he has listed it on ebay. But here's the part why I was so excited to find out about Style it, Share it Sell it! It is one thing to list something on ebay, THEN you actually have to get someone to buy it. This new ebay.com.au app allowed me to style up an ad for the stuff he is selling AND share it with everyone I know on Facebook. It increases my chances of some other poor sucker taking this thing off our hands someone buying this incredible piece of machinery to enjoy for themselves. 5 minutes - not even, is all it took to fancy his ad up a little. 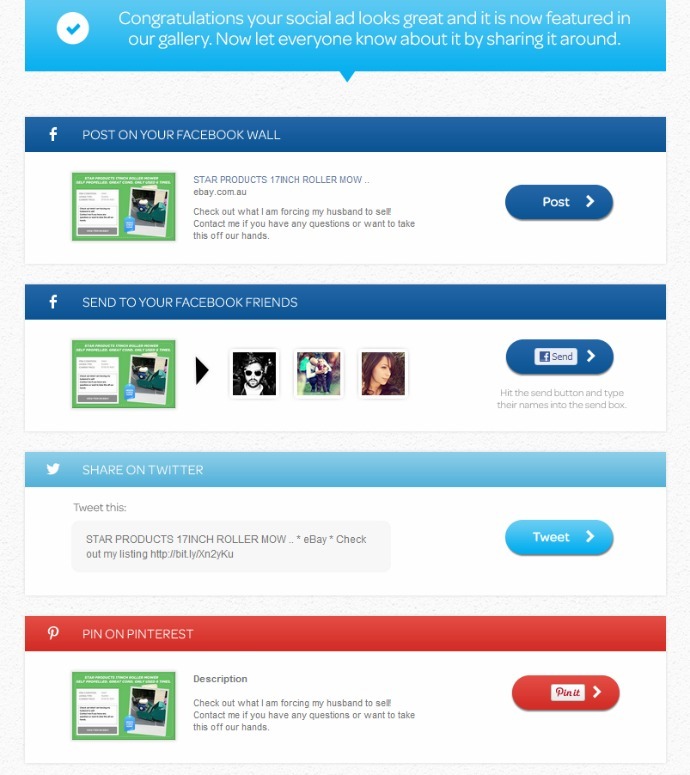 In just three simple steps you can totally pimp your eBay listing and share it with your friends/family in your own social networks, AND with all the fans on the eBay Facebook page. You can choose from a unique set of fonts, backgrounds, frames, and decals, and you can easily trick-up your eBay listing so it looks more appealing to your friends. 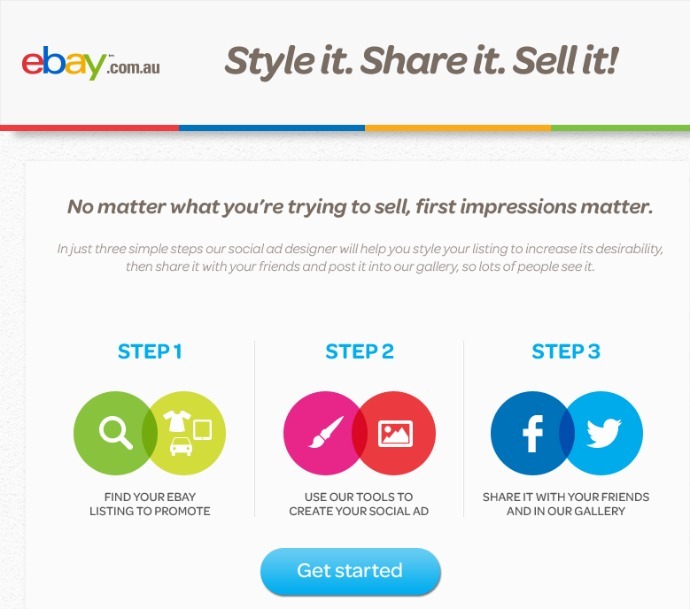 Then with one little press of a button, you can post it, send it, pin it or tweet it, as well as share it on the eBay.com.au Facebook page via the “Style It, Share It, SellIt!” gallery. Alright so lets see how I went with pimping up my hubby's lawnmower ad. First of all I went to the ebay.com.au page on Facebook and became a fan. Then I clicked on the Facebook App Style it, Share it, Sell it! Step 1: Search for your listing. You can search by your ebay name or your item id. Step 2: Next I chose a theme for my ad and had some fun playing around with the different colours, frames and backgrounds to style the ad up. Once I had previewed my ad and patted myself on the back for my cunning plan to rid our garage of all that excess junk my hubby brings in, I was ready to share it with the world. The last step is where I shared the bejeezers out of this ad all over my social network sites. Remember don't think you are just limited to sharing this with your own friends on Facebook. Nope when you use this app it is shared with EVERYONE who likes the ebay.com.au Facebook page which last time I checked was over 236 thousand fans. If you would like to know a little more about this exciting new app, check out this video below. 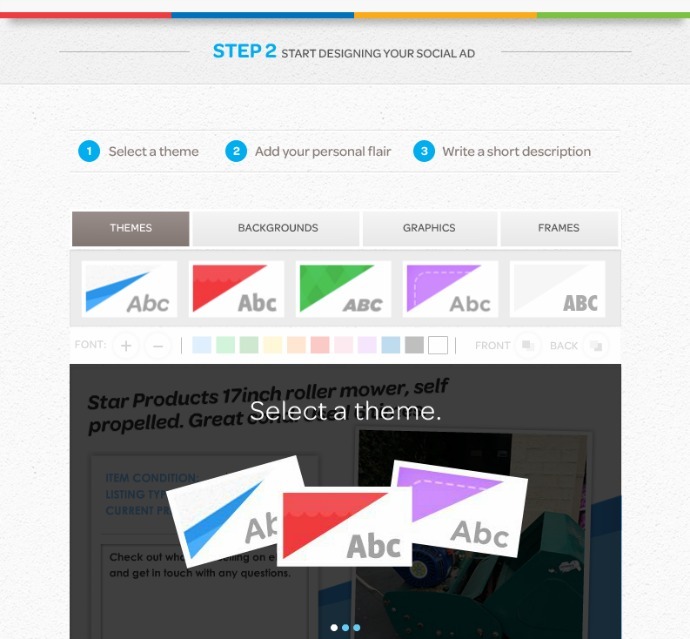 Style it, Share it, Sell it from Daniel Young on Vimeo. 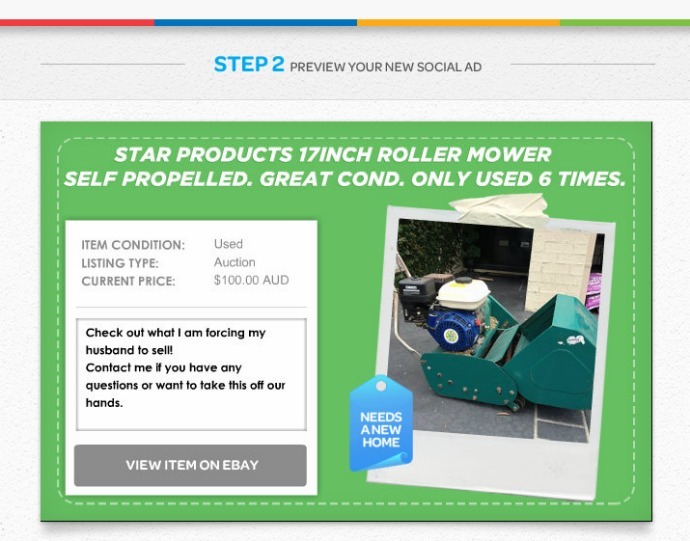 Now because they are so excited about this new app of theirs, the gang at ebay.com.au have given me the go ahead to give away $200 to one of you guys so you can totally afford to buy my husbands lawn mower. Just joking, but one lucky person will win $200 credited to their pay pal account so they can spend it on whatever they like. 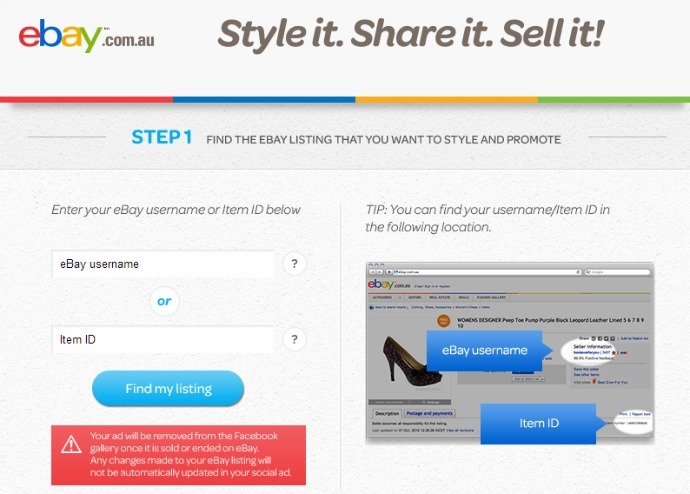 Step 2: Leave me a comment below telling me what you plan on using the ebay.com.au Style it, Share it, Sell it! app to sell. Come one be devious - it's fun! You must have a Paypal account as the $200 will be credited to your nominated Paypal account. The winner will be announced on this post right here on my blog and contacted by email. They will have 5 days to contact me to claim their prize. If the winner does not make contact me the prize will be redrawn and a new winner notified by email. The following winner was picked by my husband because he says he can relate and is hoping I might be inspired to sell some of the clothes I have been hanging on to for the past 20 years too!